Well, self-lit at least. 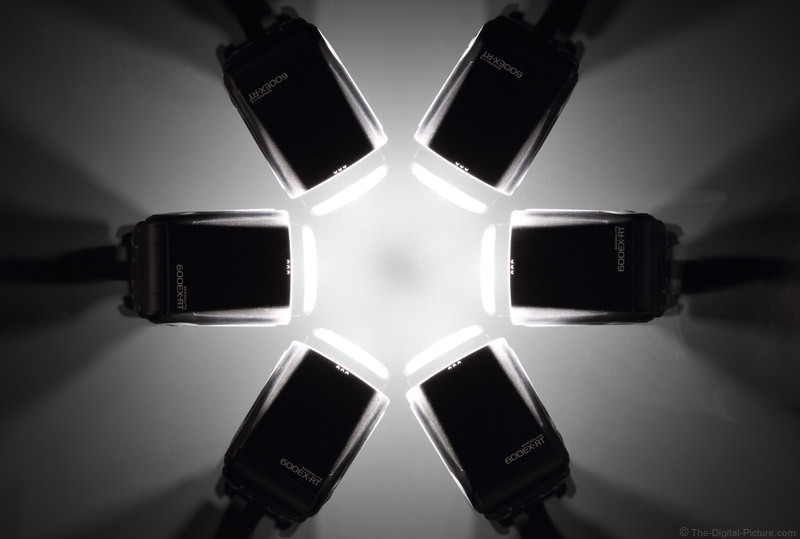 The above image shows 6 Canon Speedlite 600EX-RT Flash units lighting themselves. The flashes were triggered from a Canon ST-E3-RT Speedlite Transmitter mounted on a Canon EOS 5D Mark III DSLR (love this camera). I used a Sigma 24-105mm f/4.0 DG OS HSM Art Lens set to 57mm. ISO 100, f/11 and 1/200. The six flash units are in their included shoe stands and the heads are directed at -7 degrees (slightly downward). The flashes are sitting on a black back-painted glass desk surface. I am standing on a stool with my feet just under the glass table top. You would not believe how well this setup lights up dust and other imperfections in the glass. I microfiber-cloth-dusted immediately before and a couple of times during this shoot. The angled light across the black surface makes the dust glow. Photoshop's Dust and Scratches noise filter quickly removed most of the problem. I used the history brush to restore details that were removed with the dust (including the flash names).